Rene Rast wins the second race of the DTM weekend at Red Bull Ring to became the main opponent to the championship leader Mattias Ekstrom ahead of season’s finale at Hockenheimring in three weeks. 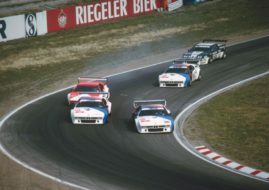 Rast leads the second 1-2-3 victory for Audi in two days as Mike Rockenfeller and Nico Muller ended a race on a podium. Audi was close to 1-2-3-4 result but Jamie Green’s perfect race turned into a disaster on the penultimate lap when some technical glitch slowed him down and he dropped from P1 to P14. Green’s unfortune became Mattias Ekstrom’s luck as he retained the big gap ahead of nearest rival. With two more races to go, Ekstrom has 172 points, twenty-one more than Rast. Green is this in the standings with 137 points, three more than Rockenfeller and BMW’s Marco Wittmann, who finished sixth today. Gary Paffett was the best Mercedes driver in the fourth place.